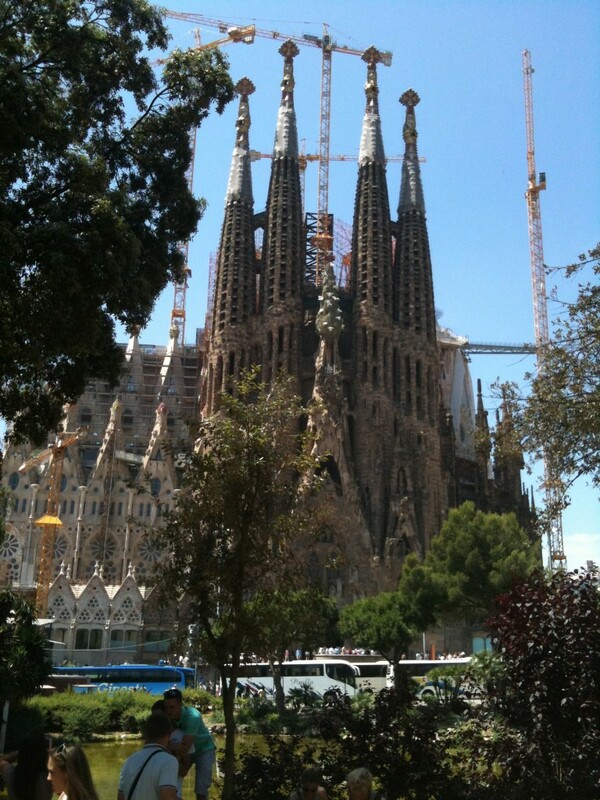 Sagrada Familia is an absolutely amazing building. Work commenced in 1882 so it has been under construction for 130 years and there’s another 30 to go. While such lengthy building projects were the norm for cathedrals of old, I can’t think of another modern building with that sort of history. It’s stunning just to contemplate the differences in building techniques and technology over that time. The building itself is of course iconic. An enormous confection of Gaudi’s modernista style combined with massive gothic touches. Inside is as amazing as the outside. 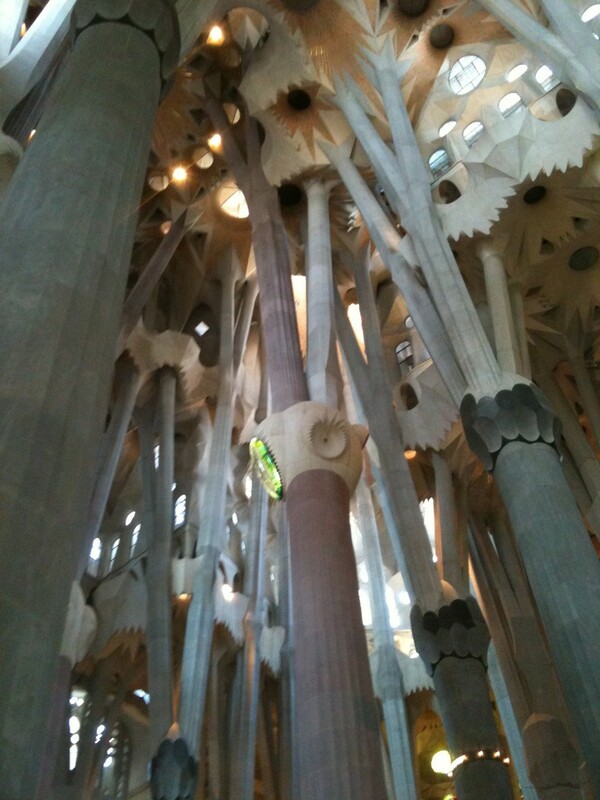 Enormous pillars branch and appear to intertwine bringing to mind, as Gaudi intended, a huge vaulting forest. Natural light fills the space with coloured highlights from the modern stained glass windows. Everywhere you look there are small touches, everything is curved, spiraled, twisted. Anyone else would have been struck speechless by the building; Callum of course was struck voluble. It was great to see him so enthused about the shapes, the forms and the approach – this from the boy who is ambivalent, at best, about art. I must admit to being a sucker for a good cathedral and this modern one is as good as any of the old greats, even if it hasn’t yet had the chance to build up any real atmosphere. It was art that took up the rest of our day with a visit to the Picasso museum. The museum sits in the old part of Barcelona and shows the progression of Picasso’s art through his life. There are some beautiful pieces but it seems his most famous artworks are elsewhere. If nothing else, on a prosaic level, the museum offered a cool, shaded place to pass some time away from the stunning heat and noise of everyday Barcelona. For those who might come after: Do not, simply do not, visit the Sagrada Familia without having bought your tickets via the internet first. You go to the website, buy the ticket and print it out at any one of a multitude of participating ATMs. That’s it. Then you arrive at the church and walk past the hundred of metres of queues and go straight in. When we arrived today the queue to buy tickets onsite stretched the entirety of the circumference of the site – I don’t even want to think about how long that would have taken in the boiling sun. We couldn’t buy tickets to the towers online though. When we arrived they offered to sell them to us then, warning that it was a further 90 minutes of queuing to get up the tower. We decided we were happy to view the building rather than the view from the building.